Home / STORE / Nisse / Nisse with Hearts. 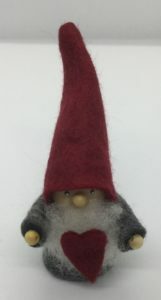 These friendly little Nisse have so much love to give. With warm hearts they send love out across the forest and beyond. He stands approx 9cm tall.